Although looking back on important milestones is always worthwhile, we believe the greatest adventures still lay ahead. Join cybersecurity leader ESET, scroll down to share your wishes and show the global ESET community how you Enjoy Safer Technology. Shape the next three decades of progress and innovation in IT security with us! Click the video to watch how ESET offices across the globe are honoring three decades of continuous progress. Cheers! The predecessor of ESET's most popular antivirus solution -ESET NOD32 Antivirus- was created in 1987. The first virus discovered by ESET co-founders Peter Paško and Miroslav Trnka was dubbed Vienna. ESET started selling its first retail product -STOPVIR- in Austria. The founders, decide upon the name ESET, an abstraction of the Egyptian goddess Aset –or- Isis. ESET lays a cornerstone for the IT Security Sector, establishing one of the earliest Antivirus Brands and one of the first IT firms in the former east bloc. Among today’s most popular resources about current cyber-threats, Virus Radar was originally established as part of a successful daily newspaper in Slovakia. From this point on, ESET began regularly updates the industry and wider public on threats detected by its technology and its growing research team. First retail version of NOD32 goes to market under the name NOD iCE. ESET NOD32 Antivirus enters the newly created comparative testing of Virus Bulletin and earns its 1st VB100 Award. ESET introduces Advanced Heuristics throught its whole product portfolio. ESET introduces Cloud Malware Detection in the form of ESET LiveGrid under its original name ThreatSense.Net, in the same year as well pioneers object reputation technology. 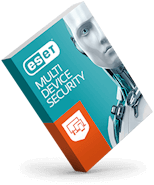 ESET technology and products are distributed in more than 100 countries globally, offering its protection to over half the planet. ESET introduces Exploit Blocker to its product portfolio. The feature monitors typically exploitable application and on top of particular CVE identifiers it focuses as well on exploitation techniques. ESET ranked 5th Largest Endpoint Security Vendor in 2013 by IDC. In the same year ESET introduces Advanced Memory Scanner, a unique ESET technology which effectively addresses an important issue of modern malware – heavy use of obfuscation and/or encryption. The ESET research team from Canada, received the first ever Peter Ször Award at the 24th Virus Bulletin International Conference for their paper on Operation Windigo. In 2015, ESET was named one of the Big Five in Deloitte’s Technology Fast 50 CE. As of January 2016, ESET had over 1300 employees globally. ESET NOD32 is the first product to ever receive 100 VB100 Awards. Percentage of women/men working in office? Most popular sport in the office? Teambuilding every year in the summer, as well as Christmas activity and dinner. Weekly team meetings. We underline everyone’s birthday (with a cake) including the birth of each employees’ child (with a small gift basket). Coffee, coffee and more coffee, except for the 10% that drinks tea. Because we are not many employees (10 exact) we are like a Family! Wednesday wine night. Friday (during the summer) lunch walk to interesting food places – exercise and good food! WE LOVE FOOD IN THIS OFFICE! We have traditional company dinners to welcome our new employees and birthday celebrations for different months employees. Cycling, running and skiing. We as well enjoy sauna and swimming. When we will move to our new offices, we will have view on the Jizera Mountains. Cake Thursday - When a member of the Marketing team, whose daughter is an amazing baker, brings in cakes for all the staff to buy. Annual bowl and binge event. Fund raising bake off events for Macmillan cancer charity, Children In Need or Comic Relief. Cycling for the boys & Zumba for Sam! Enjoying creating safer technology by working hard and playing hard! Quarterly All-hands-meeting for all employees. In case of special occasion (e.g. special award winning) we get together in a town hall meeting and celebrate our success. We have employee breakfast meeting (monthly), dart championship, employee events (e.g. Christmas Party, Sommer Party), Jena City Run, …. Share your wishes via your favorite social media with the hashtag #ESET30 to qualify for our monthly giveaway of one year licenses. Unleash your creativity! Take a cool picture for Instagram, write an inspirational post to Twitter, tag your friends on Facebook, or just praise us on LinkedIn. Don't forget to include the #ESET30 to be part of our big giveaway! The organizer of the “Wish #ESET30 Happy Birthday” contest (here in after referred to as “Contest”) is ESET, spol. s r. o., having its registered office at Einsteinova 24, 851 01 Bratislava, Slovak Republic, registered in the Commercial Register administered by Bratislava I District Court, Section Sro, Entry No 3586/B, Business Identification Number: 31 333 535 (hereinafter referred to as “ESET”). The objective of the contest is to support the creativity and activity of End Users and supporters of ESET and ESET Products in order to spread awareness about ESET’s 30th Anniversary with #ESET30 hashtag. Everyone that meets the requirements stipulated under the Article 4 of this Contest Terms (hereinafter referred to as “Participant”) shall be entitled to actively join the Contest by creating a public post with photo/image with #ESET30 hashtag included (hereinafter referred to as “Contribution”) on Twitter, Facebook, LinkedIn and/or Instagram social network. Number of Contributions of one Participant shall not be limited. The Contest is open to all physical entities who at the period of the contest’s duration, have no employment relations with ESET, its organizational entities or anyone of the ESET affiliate companies under the ESET group. ESET shall deliver 10 x ESET Internet Security, 10 x ESET Cyber Security PRO, 10 x ESET Mobile Security License with a license period of 1 year in compliance with article 8 of the Contest Terms to 30 Participants drawn from the participant pool once a month throughout the duration of the contest. Period for posting Contributions under the Article 3 of the Contest Terms begins June 1st, 2017 and ends May 31st, 2018. Winning Participants shall be announced no later than 10 days from last day of particular contest month and the winning Participant shall be contacted via regular communications channels (message) available on the social network where her/his Contributions has been published. ESET reserves all rights to change any of Contest’s dates. The Central European Time Zone is relevant for the purpose of this Contest. The drawing shall be executed via random selection from the pool of Participants in a particular month. Prizes shall be delivered to winning Participants via an email message. In case of failure to receive the answer with email address from winning Participant within the period of 7 days, ESET is entitled to drawn substitute winner Participant from the participant pool. The winning Participant has the right to refuse the prize. 4. is contrary to propriety. ESET shall be entitled to collect and process contact data and email addresses of winning Participants for the purpose of evaluation of Contest and delivery of prizes. ESET is not responsible for Participant conduct, which is inconsistent with this Statute, and is entitled at any stage to decide to cancel and remove any Contribution from the Contest and to exclude a Participant who does not qualify for participation. The laws of the Slovak Republic shall govern these Contest Terms. In case of questions, Participants shall contact ESET at globalpr@eset.com.